1) How could a leather cigar case prompt a major political scandal? Well, it certainly wouldn’t hurt if the former owner of the case was Tarik Aziz, Iraq’s former deputy prime minister under Saddam Hussein. 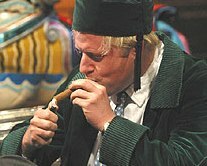 And it would also be helpful if the current owner is the mayor of London (pictured). 2) The City Council in Thousand Oaks, California unanimously voted to ban smoking in “outdoor gathering places” yesterday. The law is intended to “reduce exposure to secondhand smoke in outdoor settings.” Can you imagine a more absurd assertion? 3) Inside the Industry: CAO is introducing a “Four for the Fourth” sampler of its America line, featuring two new sizes: a box-pressed Robusto and a “Reverse Torpedo.” Continuing the lancero trend, La Aurora is rolling out production of the long, slender cigars in its Preferidos line. The Griffin’s made by Davidoff has released its 2008 limited edition cigar, a Torpedo that will run $11 per stick. 4) Around the Blogs: Stogie Review reviews a CI Legends Purple (Graycliff). Cigar Jack lights up a Punch Grand Cru Maduro. Velvet Cigar smokes a La Riqueza. Cigar Spy tries the Gurkha Legend. 5) Deal of the Week: Once again we feel it necessary to draw your attention to some real bargains from our friends at Cuban Crafters. In honor of Independence Day, they’ve cut prices on some of our favorites, including the Cabinet Selection, Don Kiki White Label, and Cupido. Check out the deals here.